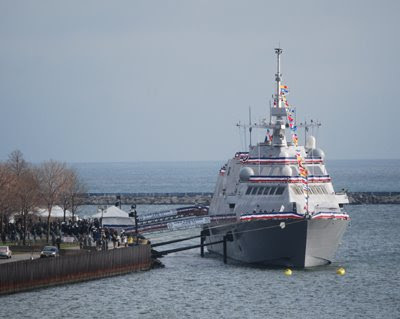 The USS Freedom (LCS-1) was commissioned today at Veterans' Park on the lakefront. The first of its kind, the Freedom is designed for shallow-water missions. The ship is over 350 feet long, and can accommodate a number of different configurations based on its mission objectives. That was a great angle! We were lucky enough to go to the event via the Boy Scouts.